At an altitude of 13,760 feet (4,300m), El Tatio is one of the world's highest geyser fields, and possibly the hottest. Surrounded by volcanoes and fed by 80 geysers and hundreds of gassy fumaroles the geyser fields are best viewed at sunrise when there are changes in atmospheric pressure; the steaming fumaroles are particularly spectacular at this time, shooting up clouds of steam about 35 feet (112m) into the air. Mineral deposits left behind after the evaporation of the boiling water have formed other interesting structures on the thin crust of the geyser field. While it is possible to bathe in the hot geyser water in a small pool, parts of the field are very dangerous with only a thin crust over nearly boiling mud so it is always a good idea to visit the geysers with a knowledgeable guide. This is a glorious attraction for photographers as the steam and the odd landscape make for dramatic pictures. The geysers are not great for anybody who has respiratory issues though, so visitors with breathing problems should proceed with caution. Also, be sure to wear layers because although the pre-dawn temperatures are freezing, it is much warmer at the geysers. 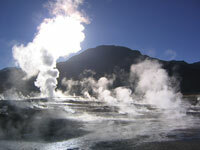 Most travellers visit the geysers as part of a guided tour. These usually leave San Pedro de Atacama early in the morning. Many operators offer this trip and it is worth shopping around to find the best option. Many geyser tours include a stop at nearby hot springs in the desert which is a great addition.